The Kalahari Basin holds the greatest accumulation of sand in the world, stretching from the Orange River to the rainforests of the Congo. The arid areas of the Kalahari covers around 80 percent of Botswana. Vast stretches of deep sand that soak up every drop of erratic summer rainfall, leaving no surface water, but storing moisture underground that supports woodland and savannah, and herds of wildlife. Even the mighty Okavango River is absorbed as it meanders out into the Kalahari. But where it is slowed by the sand, it creates a great inland delta, an unsurpassed wilderness of clear channels, swamps and thickets teeming with wildlife. In 1967, a year after Botswana' s independence, diamonds were discovered in its hinterlands, providing the sparsely populated country with a strong economy in addition to its stable political structure. A far-sighted conservation policy protects 18% of the country in national parks and reserves. 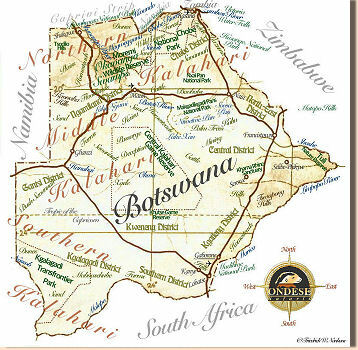 And so Botswana remains a vast, largely roadless wilderness of deep Kalahari sands, great salt pans and savannahs. And somewhere in that vastness lies its greatest jewel, the Okavango Delta.